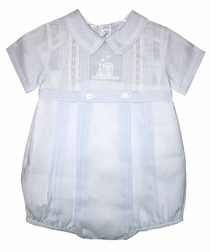 A sweet blue bubble/romper for baby boys by Feltman Brothers. The romper has a cute little belt feature and is hand embroidered in the center chest with a train engine. Love it! Perfect for baby showers and new baby gifts!